Wrapped in a brushed stainless steel shell and featuring a nonstick interior, this compact oven features convection cooking via an internal fan that circulates the heat to speed up the cooking process. 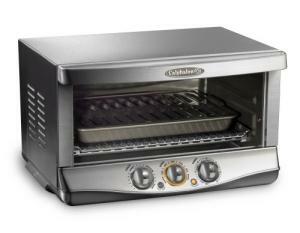 The front mounted controls are simple rotary dials that allow quick access to the toast, bake and broil features, as well as the convection fan option. This oven has the usual 60 minute timer common to the genre, although it also features an always on setting for longer cooking items-- indeed a nice touch. There is still an auto shut-off which turns the oven off after two hours regardless of the other settings-- an important safety feature as well. The internal capacity of this model is 0.7 cubic-feet. It will cook up your convenience foods and basically anything that you can fit into its 9 x 13 pan. The 1400-watt elements promise to be substantial enough to handle all the melting and browning you require, without heating up the kitchen as your large oven would. If you value a toaster oven for compact size, convection heating and simple uncluttered controls, and don't mind paying a premium for the Calphalon name, this may be just the model for you. There are some users that find the interior too cramped for convenience, and the temperature control seems to be rather imprecise. This product comes with a nonstick broil pan and includes a removable crumb tray. Compare this with the Cuisinart Automatic Convection Toaster Oven.